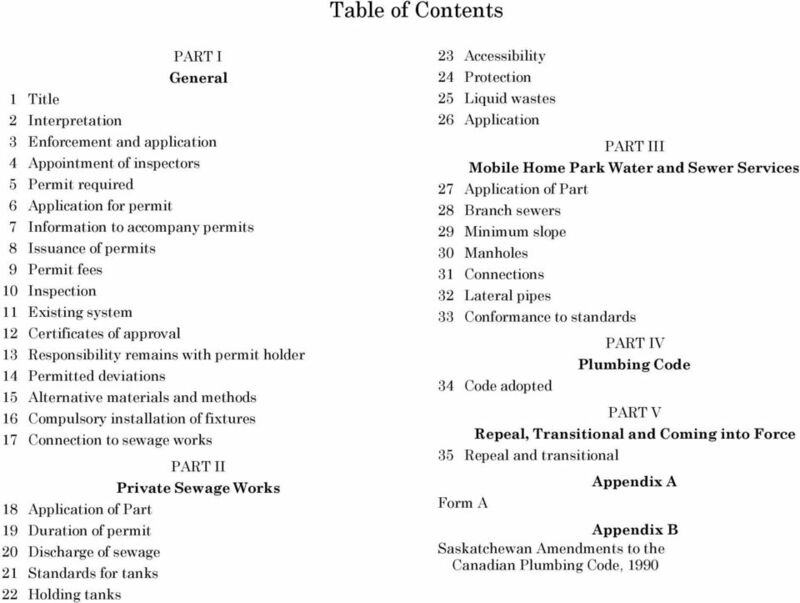 Download "The Plumbing and Drainage Regulations"
1 PLUMBING AND DRAINAGE 1 The Plumbing and Drainage Regulations Repealed by Chapter P-37.1 Reg 13 (effective October 1, 2011). Formerly Chapter P-37.1 Reg 1 (effective January 1, 1997). NOTE: This consolidation is not official. Amendments have been incorporated for convenience of reference and the original statutes and regulations should be consulted for all purposes of interpretation and application of the law. In order to preserve the integrity of the original statutes and regulations, errors that may have appeared are reproduced in this consolidation. 4 4 PLUMBING AND DRAINAGE (l) privy vault means a storage or holding tank placed under a toilet that is not connected to a plumbing system and that is intended to be used only for the confinement and storage of human excrement; (m) qualified person means a person who is recognized by the local authority to have the equipment, experience and capability necessary to: (i) properly install or design a private sewage works; or (ii) properly install: (A) a building sewer; or (B) a water service; (n) septic tank means a two-compartment tank of which the first compartment is a settling tank and the second compartment is a storage compartment for the effluent from the first compartment; (o) sewage holding tank means a tank designed to collect and hold sewage without treatment prior to its being transported to a final point of disposal; (p) shoreland development area means an area of land: (i) that has been designated as a reservoir development area by regulations made pursuant to The Environmental Management and Protection Act; or (ii) that is within 457 metres of the high water mark of a river, stream or other body of water and on which: (A) all or part of an urban municipality is situated; (B) all or part of a summer resort is situated; or (C) all or part of a recreational area has been or is being established; (q) surface water means water that is above the surface of land and in a river, stream, watercourse, lake, creek, spring, ravine, coulee, canyon, lagoon, swamp, marsh or other body of water; (r) trailer means a structure designed to provide a temporary living accommodation for travel, vacation or recreational use and to be driven, towed or transported, having an overall length not exceeding 12.5 metres and an overall width not exceeding 2.6 metres, where the width is the sum of the distances from the vehicle centre line to the outmost projections on each side. (2) Unless otherwise provided for in the Act or these regulations, words and expressions used in these regulations that are defined in the code have the same meaning in these regulations as in the code. 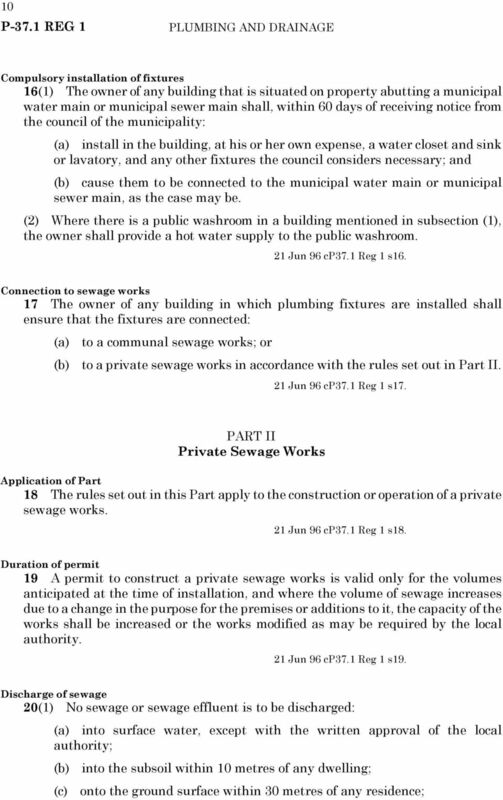 (3) In these regulations, a reference to a local authority with respect to a plumbing system or a private sewage works is a reference to the local authority that has jurisdiction over the area in which the plumbing system or private sewage works is to be established, constructed, extended, renovated, altered, repaired or connected to a communal sewage works or communal waterworks. 21 Jun 96 cp37.1 Reg 1 s2. 7 PLUMBING AND DRAINAGE 7 (b) the dwelling unit is located in an urban municipality that is not operating or constructing a communal sewage works or a communal waterworks; and (c) the dwelling unit is intended to be used exclusively for living quarters and will be occupied by the owner. (5) In addition to the persons who meet the requirements set out in subsections (3) and (4), a permit to install a building sewer, water services or a private sewage works may be issued to a sewage, water or plumbing contractor who has been found to be a qualified person by the local authority. 21 Jun 96 cp37.1 Reg 1 s8. 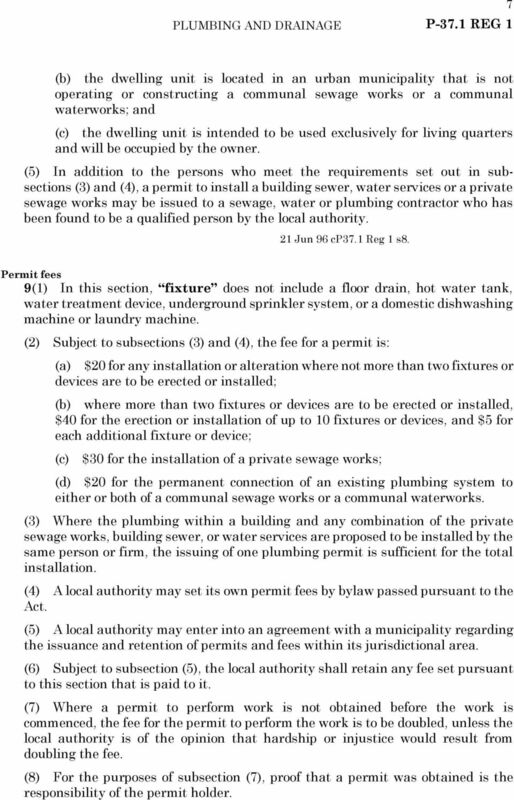 Permit fees 9(1) In this section, fixture does not include a floor drain, hot water tank, water treatment device, underground sprinkler system, or a domestic dishwashing machine or laundry machine. (2) Subject to subsections (3) and (4), the fee for a permit is: (a) $20 for any installation or alteration where not more than two fixtures or devices are to be erected or installed; (b) where more than two fixtures or devices are to be erected or installed, $40 for the erection or installation of up to 10 fixtures or devices, and $5 for each additional fixture or device; (c) $30 for the installation of a private sewage works; (d) $20 for the permanent connection of an existing plumbing system to either or both of a communal sewage works or a communal waterworks. (3) Where the plumbing within a building and any combination of the private sewage works, building sewer, or water services are proposed to be installed by the same person or firm, the issuing of one plumbing permit is sufficient for the total installation. (4) A local authority may set its own permit fees by bylaw passed pursuant to the Act. (5) A local authority may enter into an agreement with a municipality regarding the issuance and retention of permits and fees within its jurisdictional area. (6) Subject to subsection (5), the local authority shall retain any fee set pursuant to this section that is paid to it. (7) Where a permit to perform work is not obtained before the work is commenced, the fee for the permit to perform the work is to be doubled, unless the local authority is of the opinion that hardship or injustice would result from doubling the fee. (8) For the purposes of subsection (7), proof that a permit was obtained is the responsibility of the permit holder. 8 8 PLUMBING AND DRAINAGE (9) Where it is necessary to reinspect an installation connected to a communal sewage works or a communal waterworks due to noncompliance with the standards imposed by these regulations or the code, the permit holder may be charged an additional fee, payable to the same local authority, subject to subsection (5), to which the original fee was payable, equal to the lesser of: (a) the amount of the original fee; and (b) $ Jun 96 cp37.1 Reg 1 s9. Inspection 10(1) A plumbing system or a private sewage works for which a permit is required pursuant to these regulations: (a) may be inspected or tested by the local authority at any time; and (b) shall not be put into use until permission has been granted by the local authority. (2) A permit holder who has executed work for which a permit has been issued shall notify the local authority when the work is ready for inspection and testing. (3) The permit holder shall provide the equipment, material, power and labour that is required for the inspection and testing. (4) The permit holder, or a representative of the permit holder who possesses qualifications acceptable to the local authority, shall be present at the time of the inspection. (5) No part of the plumbing system or the private sewage works is to be covered until permission is granted by the local authority. (6) If any part of the plumbing system or the private sewage works is covered before permission is granted, the permit holder shall uncover it if the local authority so directs. 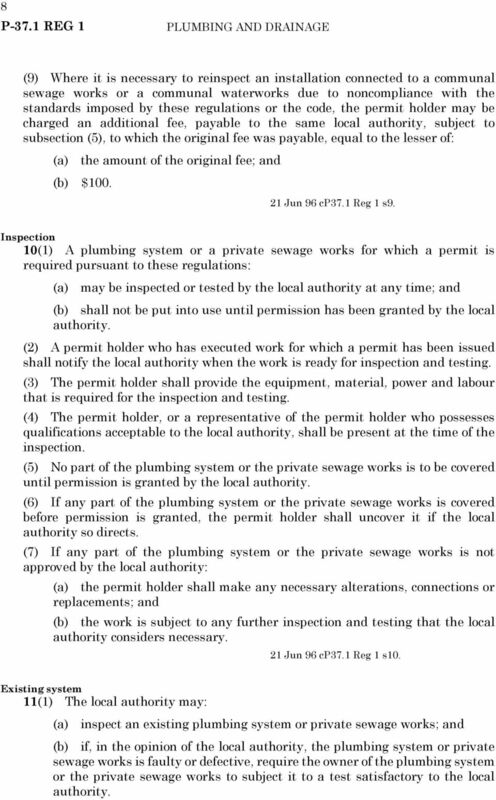 (7) If any part of the plumbing system or the private sewage works is not approved by the local authority: (a) the permit holder shall make any necessary alterations, connections or replacements; and (b) the work is subject to any further inspection and testing that the local authority considers necessary. 21 Jun 96 cp37.1 Reg 1 s10. Existing system 11(1) The local authority may: (a) inspect an existing plumbing system or private sewage works; and (b) if, in the opinion of the local authority, the plumbing system or private sewage works is faulty or defective, require the owner of the plumbing system or the private sewage works to subject it to a test satisfactory to the local authority. 9 PLUMBING AND DRAINAGE 9 (2) Where a test required pursuant to subsection (1) indicates that an existing plumbing system or private sewage works is faulty or defective, the owner shall make any repair, alteration or replacement that the local authority considers necessary. 21 Jun 96 cp37.1 Reg 1 s11. Certificates of approval 12(1) If requested, a certificate of approval shall be issued to the owner and the permit holder when a plumbing system or private sewage works has been found satisfactory on its final inspection, except where the plumbing system is certified by the Canadian Standards Association. 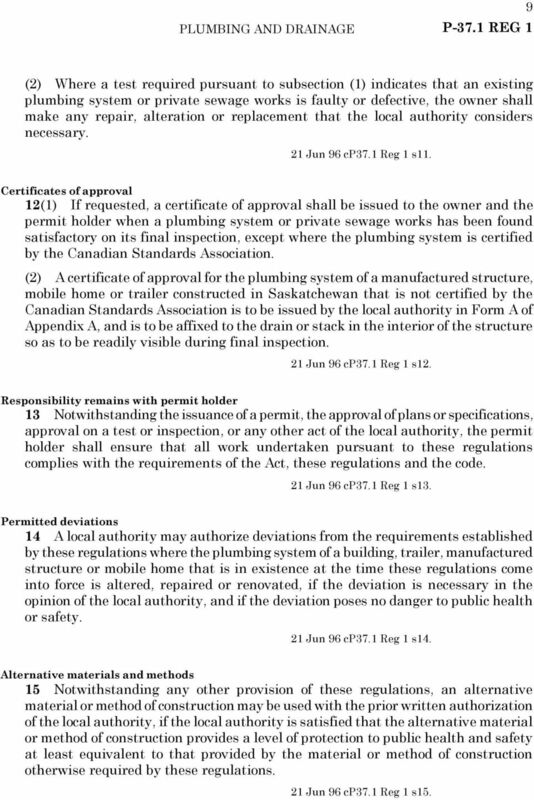 (2) A certificate of approval for the plumbing system of a manufactured structure, mobile home or trailer constructed in Saskatchewan that is not certified by the Canadian Standards Association is to be issued by the local authority in Form A of Appendix A, and is to be affixed to the drain or stack in the interior of the structure so as to be readily visible during final inspection. 21 Jun 96 cp37.1 Reg 1 s12. Responsibility remains with permit holder 13 Notwithstanding the issuance of a permit, the approval of plans or specifications, approval on a test or inspection, or any other act of the local authority, the permit holder shall ensure that all work undertaken pursuant to these regulations complies with the requirements of the Act, these regulations and the code. 21 Jun 96 cp37.1 Reg 1 s13. Permitted deviations 14 A local authority may authorize deviations from the requirements established by these regulations where the plumbing system of a building, trailer, manufactured structure or mobile home that is in existence at the time these regulations come into force is altered, repaired or renovated, if the deviation is necessary in the opinion of the local authority, and if the deviation poses no danger to public health or safety. 21 Jun 96 cp37.1 Reg 1 s14. Alternative materials and methods 15 Notwithstanding any other provision of these regulations, an alternative material or method of construction may be used with the prior written authorization of the local authority, if the local authority is satisfied that the alternative material or method of construction provides a level of protection to public health and safety at least equivalent to that provided by the material or method of construction otherwise required by these regulations. 21 Jun 96 cp37.1 Reg 1 s15. 11 PLUMBING AND DRAINAGE 11 (d) onto the ground surface or into the subsoil: (i) within the limits of any city, town, village, organized hamlet, or approved subdivision containing at least two parcels, or within one kilometre of its boundary, except with the written approval of the local authority or the minister; or (ii) within 15 metres of a drilled well properly constructed, or within 30 metres of any other well or water supply used for domestic purposes; or (e) into a storm sewer. 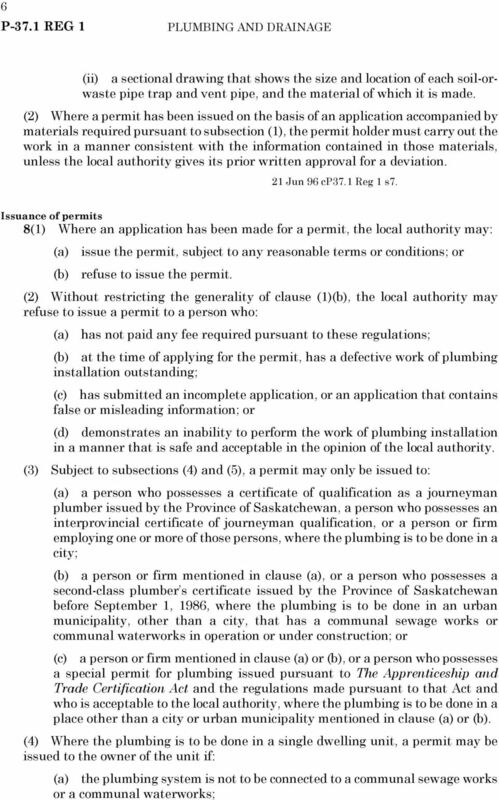 (2) Except where approved pursuant to The Environmental Management and Protection Act, sewage in a shoreland development area must be disposed of in accordance with The Shoreland Pollution Control Regulations, 1976, being Saskatchewan Regulations 54/76. (3) Sewage from every building not connected to a communal sewage works must drain into a private sewage works. (4) Where a plumbing system includes fixtures such as a toilet, bath or shower, the private sewage works shall be designed and operated to receive all sewage, including kitchen, lavatory and laundry wastes, but not roof or other storm water. 21 Jun 96 cp37.1 Reg 1 s20. Standards for tanks 21(1) In all shoreland development areas, urban centres and subdivisions, prefabricated septic or sewage holding tanks must conform to CSA Standard CAN3-B66-M90 for Prefabricated septic tanks and sewage holding tanks, except that an inlet baffle must not be an elbow fitting. 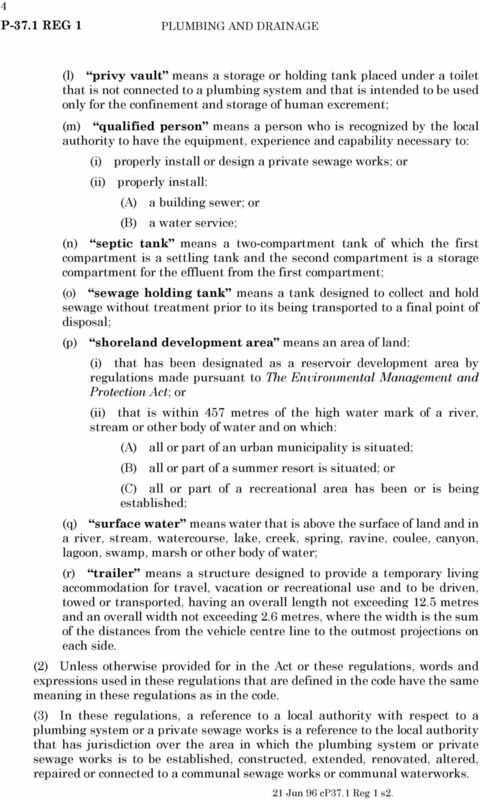 (2) Poured-in-place tanks may be used in locations other than shoreland development areas, urban centres or subdivisions if their construction meets with the approval of the local authority. 21 Jun 96 cp37.1 Reg 1 s21. 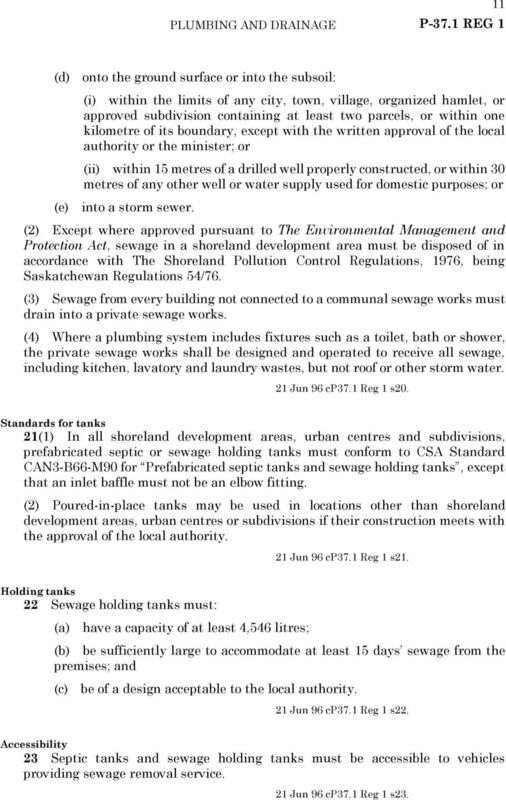 Holding tanks 22 Sewage holding tanks must: (a) have a capacity of at least 4,546 litres; (b) be sufficiently large to accommodate at least 15 days sewage from the premises; and (c) be of a design acceptable to the local authority. 21 Jun 96 cp37.1 Reg 1 s22. Accessibility 23 Septic tanks and sewage holding tanks must be accessible to vehicles providing sewage removal service. 21 Jun 96 cp37.1 Reg 1 s23. 12 12 PLUMBING AND DRAINAGE Protection 24 Except for sewage lagoons, all components of a private sewage works must have adequate protection from freezing, and odours must be minimized. 21 Jun 96 cp37.1 Reg 1 s24. Liquid wastes 25 Sewage lagoons, absorption fields, above-ground filters, jet-type disposal systems, sewage holding tanks, privy vaults and other systems for the disposal or storage of liquid wastes may only be constructed or installed with the prior written approval of the local authority. 21 Jun 96 cp37.1 Reg 1 s25. Application 26 An application for approval pursuant to section 25 must be accompanied by satisfactory evidence that the proposed disposal system has been designed by a qualified person. 21 Jun 96 cp37.1 Reg 1 s26. 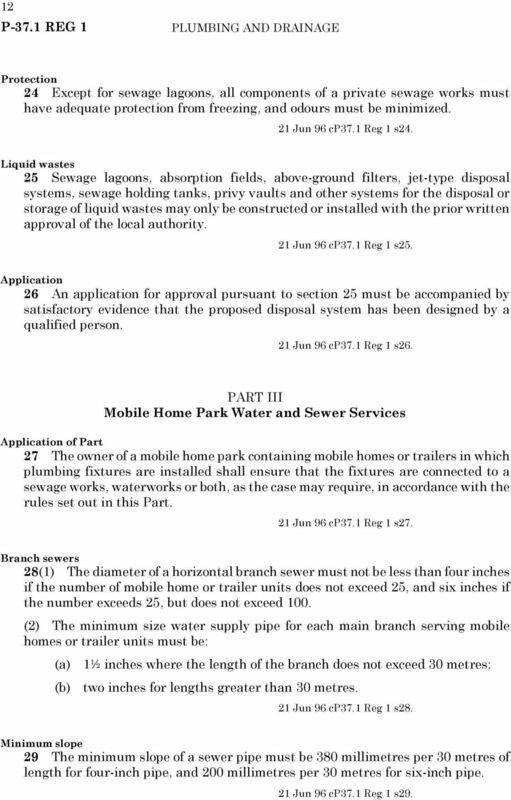 PART III Mobile Home Park Water and Sewer Services Application of Part 27 The owner of a mobile home park containing mobile homes or trailers in which plumbing fixtures are installed shall ensure that the fixtures are connected to a sewage works, waterworks or both, as the case may require, in accordance with the rules set out in this Part. 21 Jun 96 cp37.1 Reg 1 s27. Branch sewers 28(1) The diameter of a horizontal branch sewer must not be less than four inches if the number of mobile home or trailer units does not exceed 25, and six inches if the number exceeds 25, but does not exceed 100. (2) The minimum size water supply pipe for each main branch serving mobile homes or trailer units must be: (a) 1½ inches where the length of the branch does not exceed 30 metres; (b) two inches for lengths greater than 30 metres. 21 Jun 96 cp37.1 Reg 1 s28. Minimum slope 29 The minimum slope of a sewer pipe must be 380 millimetres per 30 metres of length for four-inch pipe, and 200 millimetres per 30 metres for six-inch pipe. 21 Jun 96 cp37.1 Reg 1 s29. 13 PLUMBING AND DRAINAGE 13 Manholes 30(1) At every mobile home park, a manhole and an approved water supply must be provided for use at a trailer sewage disposal station. (2) Except as provided in subsection (3), a manhole must be installed on horizontal sewers: (a) at the junction of two or more branches; and (b) at any change in direction. (3) Where the branch is less than 30 metres in length or where the change in direction is less than 90, a cleanout may be substituted for a manhole. (4) A cleanout must: (a) extend to the ground surface at an angle of not more than 45 from the horizontal; and (b) be adequately protected and capped. 21 Jun 96 cp37.1 Reg 1 s30. Connections 31 A connection between a branch sewer and a lateral is to be made with a 45 Y. 21 Jun 96 cp37.1 Reg 1 s31. Lateral pipes 32(1) The lateral pipe size for each mobile home or trailer unit connection is to be not less than three inches. (2) A lateral must extend not less than 100 millimetres above the ground surface and the terminal must be protected by a metal casing or concrete mount. 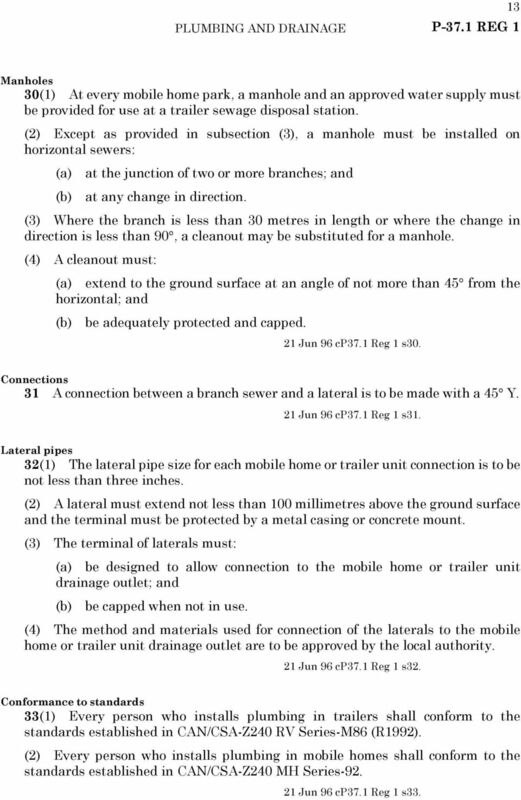 (3) The terminal of laterals must: (a) be designed to allow connection to the mobile home or trailer unit drainage outlet; and (b) be capped when not in use. (4) The method and materials used for connection of the laterals to the mobile home or trailer unit drainage outlet are to be approved by the local authority. 21 Jun 96 cp37.1 Reg 1 s32. Conformance to standards 33(1) Every person who installs plumbing in trailers shall conform to the standards established in CAN/CSA-Z240 RV Series-M86 (R1992). 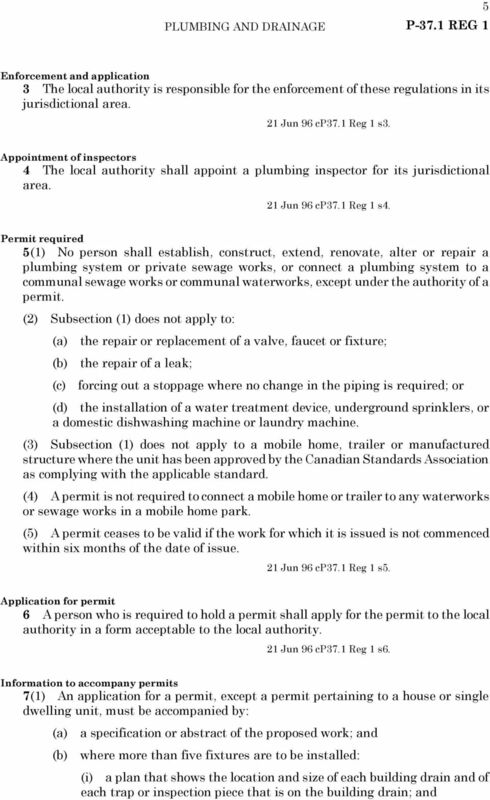 (2) Every person who installs plumbing in mobile homes shall conform to the standards established in CAN/CSA-Z240 MH Series Jun 96 cp37.1 Reg 1 s33. 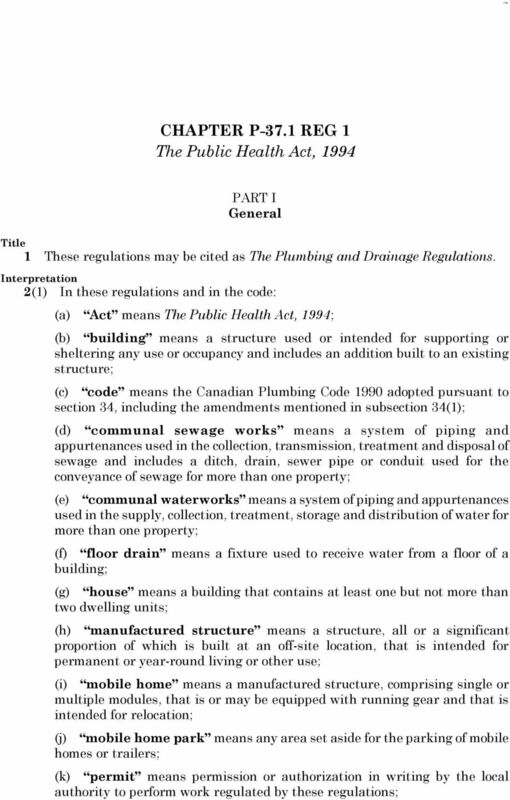 14 14 PLUMBING AND DRAINAGE PART IV Plumbing Code Code adopted 34(1) The Canadian Plumbing Code 1990, issued by the Associate Committee on the National Building Code of the National Research Council of Canada, as amended from time to time, including any revisions and errata, is declared to be in force, subject to the amendments set out in Appendix B. (2) Subject to any contrary provision in the Act or these regulations, every person who is required to comply with these regulations is required to comply with the code. 21 Jun 96 cp37.1 Reg 1 s34. PART V Repeal, Transitional and Coming into Force Repeal and transitional 35(1) Saskatchewan Regulations 8/78 are repealed. 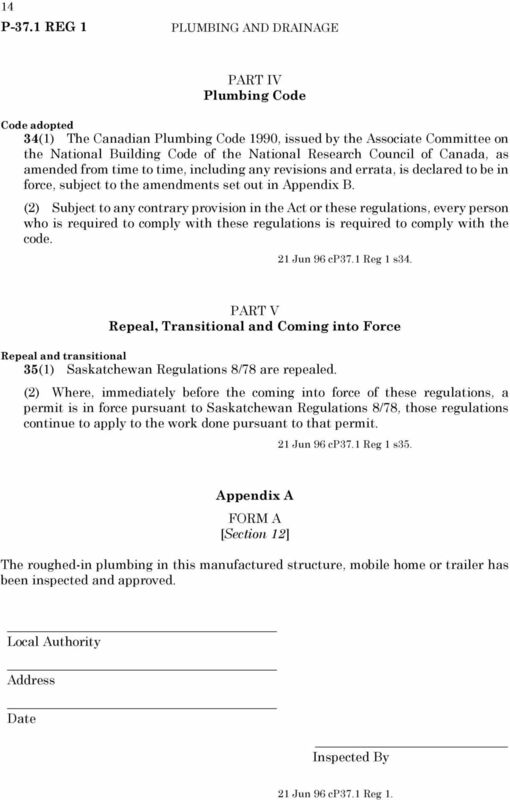 (2) Where, immediately before the coming into force of these regulations, a permit is in force pursuant to Saskatchewan Regulations 8/78, those regulations continue to apply to the work done pursuant to that permit. 21 Jun 96 cp37.1 Reg 1 s35. Appendix A FORM A [Section 12] The roughed-in plumbing in this manufactured structure, mobile home or trailer has been inspected and approved. Local Authority Address Date Inspected By 21 Jun 96 cp37.1 Reg 1. 16 16 PLUMBING AND DRAINAGE (g) by repealing the definition of Private water supply system and substituting the following: Private waterworks means a privately owned works that is located on one property and is intended to be used for the supply, collection, treatment, storage and distribution of water for one owner and that: (a) has an average flow, as determined by the local authority, that does not exceed 18 cubic metres per 24-hour period, based on the three consecutive months having the greatest flow in a year; and (b) does not include water for industrial use ; and (h) by repealing the definition of Water system and substituting the following: Water system means an assembly of pipes, fittings, control valves and appurtenances that convey water from a communal waterworks, starting at the property line or a private water supply source, to the water supply outlets of fixtures or devices. 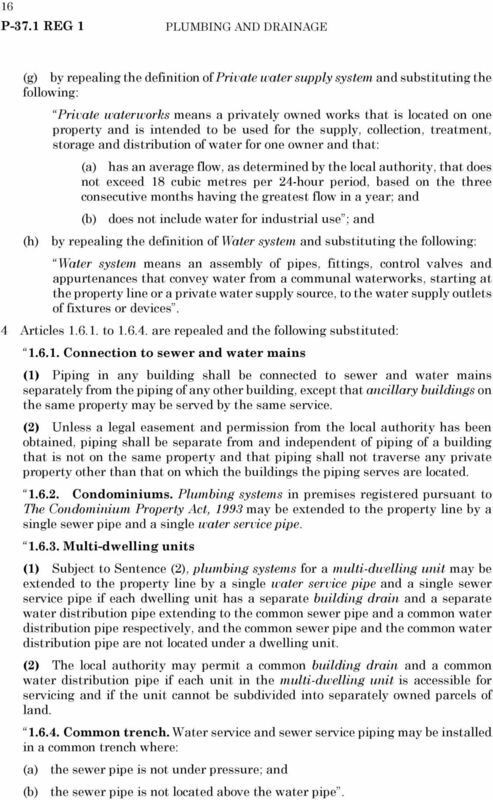 4 Articles to are repealed and the following substituted: Connection to sewer and water mains (1) Piping in any building shall be connected to sewer and water mains separately from the piping of any other building, except that ancillary buildings on the same property may be served by the same service. (2) Unless a legal easement and permission from the local authority has been obtained, piping shall be separate from and independent of piping of a building that is not on the same property and that piping shall not traverse any private property other than that on which the buildings the piping serves are located Condominiums. Plumbing systems in premises registered pursuant to The Condominium Property Act, 1993 may be extended to the property line by a single sewer pipe and a single water service pipe Multi-dwelling units (1) Subject to Sentence (2), plumbing systems for a multi-dwelling unit may be extended to the property line by a single water service pipe and a single sewer service pipe if each dwelling unit has a separate building drain and a separate water distribution pipe extending to the common sewer pipe and a common water distribution pipe respectively, and the common sewer pipe and the common water distribution pipe are not located under a dwelling unit. (2) The local authority may permit a common building drain and a common water distribution pipe if each unit in the multi-dwelling unit is accessible for servicing and if the unit cannot be subdivided into separately owned parcels of land Common trench. Water service and sewer service piping may be installed in a common trench where: (a) the sewer pipe is not under pressure; and (b) the sewer pipe is not located above the water pipe. 17 PLUMBING AND DRAINAGE 17 5 Article is amended by adding the following Sentence after Sentence (2): (3) Fixtures shall be so located that: (a) the minimum distance from the front face of the water closet bowl to a wall or face of another fixture is not less than 450 mm. ; (b) the minimum distance from the front face of the lavatory to the face of another fixture is not less than 450 mm. and to a wall not less than 530 mm. ; and (c) the minimum distance from the face of the bath tub to the face of another fixture is not less than 450 mm. 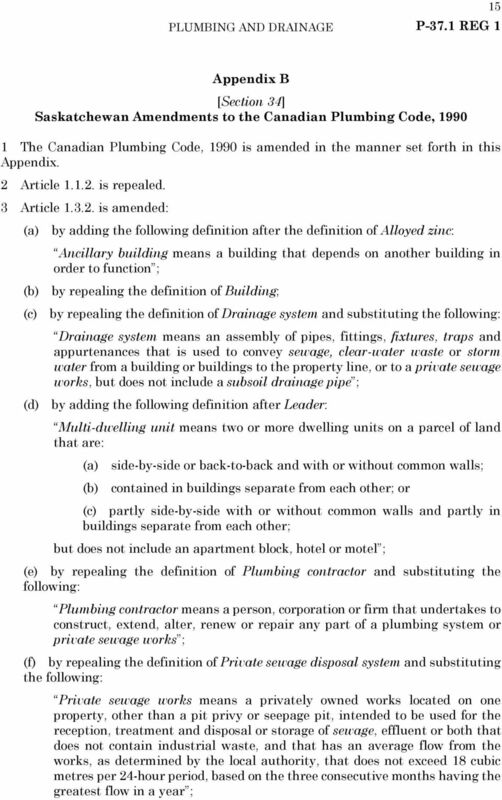 and to a wall not less than 530 mm.. 6 Sentence (1) is repealed and the following substituted: (1) Plumbing drawings shall be submitted in accordance with the provisions of The Plumbing and Drainage Regulations. 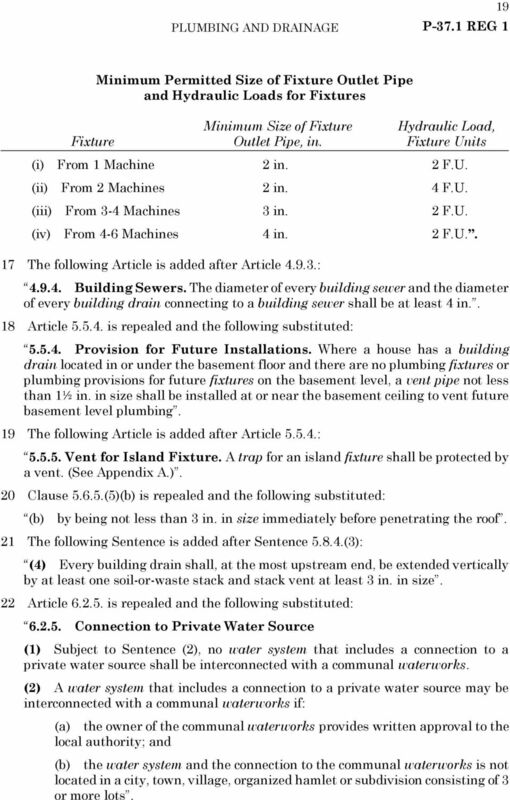 7 Article is amended: (a) by renumbering it as Sentence (1); and (b) by adding the following Sentence after Sentence (1): (2) Notwithstanding that any provision of this code requires certain specified materials to be used, any other material may be approved by the local authority if the material: (a) is shown to be satisfactory for the purpose intended by certification from Canadian Standards Association, Warnock Hersey or any other recognized testing laboratory; and (b) is at least the equivalent of that required in these regulations in quality, strength, effectiveness, resistance, durability and safety. 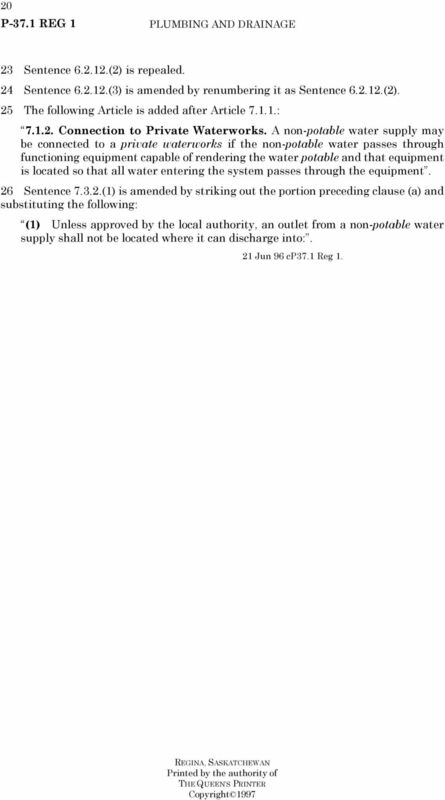 8 Sentence (2) is repealed and the following substituted: (2) Only materials and equipment that are approved by the local authority shall be used in a drainage system conveying excessively corrosive wastes. 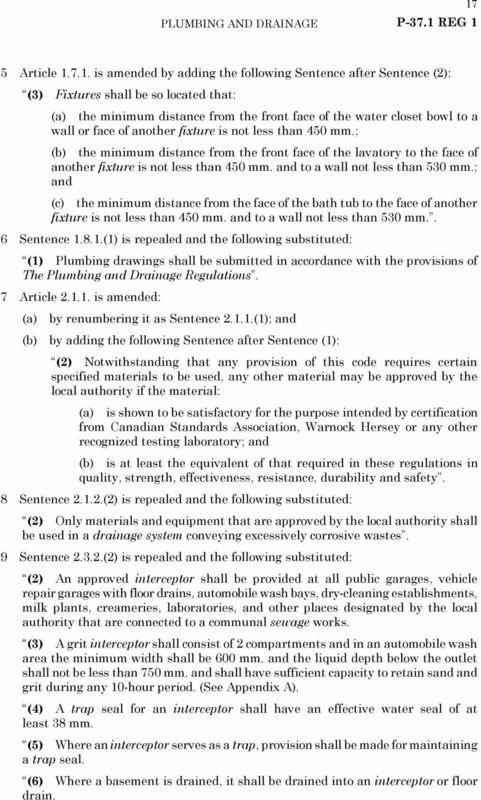 9 Sentence (2) is repealed and the following substituted: (2) An approved interceptor shall be provided at all public garages, vehicle repair garages with floor drains, automobile wash bays, dry-cleaning establishments, milk plants, creameries, laboratories, and other places designated by the local authority that are connected to a communal sewage works. (3) A grit interceptor shall consist of 2 compartments and in an automobile wash area the minimum width shall be 600 mm. and the liquid depth below the outlet shall not be less than 750 mm. and shall have sufficient capacity to retain sand and grit during any 10-hour period. (See Appendix A). (4) A trap seal for an interceptor shall have an effective water seal of at least 38 mm. (5) Where an interceptor serves as a trap, provision shall be made for maintaining a trap seal. (6) Where a basement is drained, it shall be drained into an interceptor or floor drain. 19 PLUMBING AND DRAINAGE 19 Minimum Permitted Size of Fixture Outlet Pipe and Hydraulic Loads for Fixtures Minimum Size of Fixture Hydraulic Load, Fixture Outlet Pipe, in. Fixture Units (i) From 1 Machine 2 in. 2 F.U. (ii) From 2 Machines 2 in. 4 F.U. (iii) From 3-4 Machines 3 in. 2 F.U. (iv) From 4-6 Machines 4 in. 2 F.U.. 17 The following Article is added after Article : Building Sewers. The diameter of every building sewer and the diameter of every building drain connecting to a building sewer shall be at least 4 in.. 18 Article is repealed and the following substituted: Provision for Future Installations. Where a house has a building drain located in or under the basement floor and there are no plumbing fixtures or plumbing provisions for future fixtures on the basement level, a vent pipe not less than 1½ in. in size shall be installed at or near the basement ceiling to vent future basement level plumbing. 19 The following Article is added after Article : Vent for Island Fixture. A trap for an island fixture shall be protected by a vent. (See Appendix A.). 20 Clause (5)(b) is repealed and the following substituted: (b) by being not less than 3 in. in size immediately before penetrating the roof. 21 The following Sentence is added after Sentence (3): (4) Every building drain shall, at the most upstream end, be extended vertically by at least one soil-or-waste stack and stack vent at least 3 in. in size. 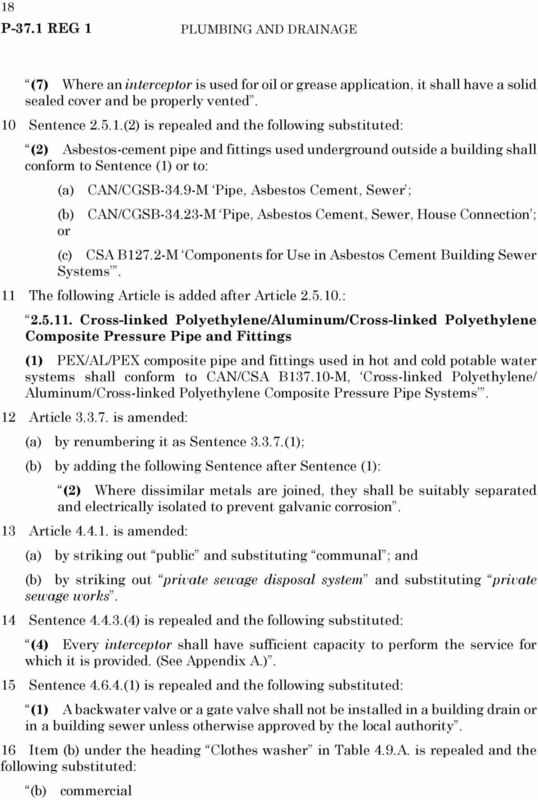 22 Article is repealed and the following substituted: Connection to Private Water Source (1) Subject to Sentence (2), no water system that includes a connection to a private water source shall be interconnected with a communal waterworks. (2) A water system that includes a connection to a private water source may be interconnected with a communal waterworks if: (a) the owner of the communal waterworks provides written approval to the local authority; and (b) the water system and the connection to the communal waterworks is not located in a city, town, village, organized hamlet or subdivision consisting of 3 or more lots. CHAPTER 9 VENTS. copper drainage tube Type DWV, Schedule 40 plastic piping, or borosilicate glass. EXCLUSIONS AND EXEMPTIONS OF THE PA UNIFORM CONSTRUCTION CODE AS PER THE PA UNIFORM CONSTRUCTION CODE CHAPTER 403 ADMINISTRATION EFFECTIVE 12/31/2009 403.1. Scope. GENERALLY (b) Exclusions and exemptions. Texas State Board of Plumbing Examiners Plumbing Inspector Examination Review Course The following Examination Review Course is designed to assist an applicant in preparing for the Plumbing Inspector examination. CONSTRUCTION FIRE SAFETY PLANNING GUIDELINES Review the following information pertaining to Construction Fire Safety Planning: B.C. Building Code Sections 8.1 up to and including Subsection 8.2.3 B.C. 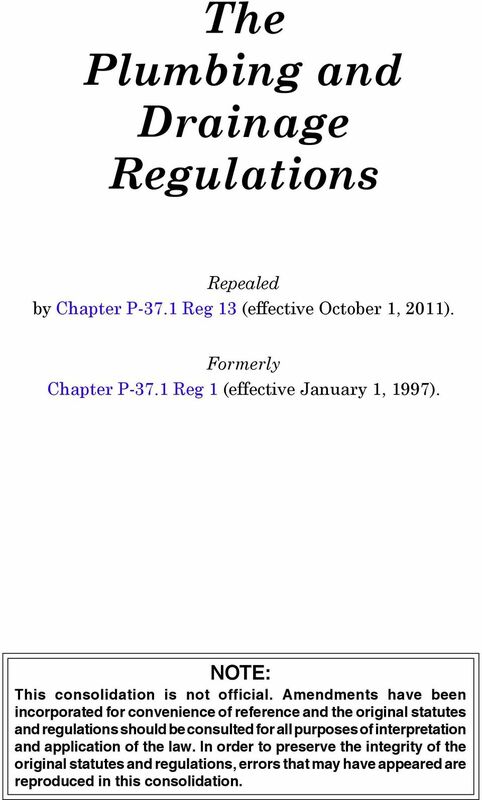 PLEASE NOTE This document, prepared by the Legislative Counsel Office, is an office consolidation of this regulation, current to August 1, 2013. It is intended for information and reference purposes only.